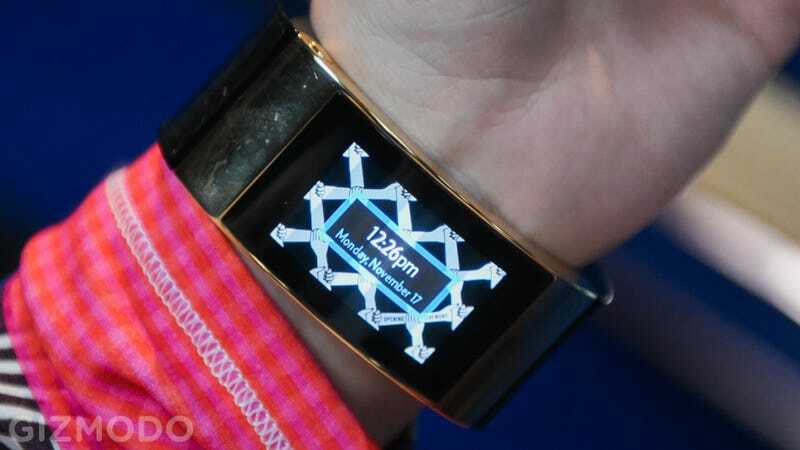 Early this fall, Intel announced its first "luxury smart bracelet" built in conjunction with Opening Ceremony and aimed specifically at the ladiez. Today, we finally got to spend some time with the device and can say with total confidence: Yep, that is one pretty... beeper? The most important thing to note here is that Intel's MICA (My Intelligent Communication Accessory) comes with its very own SIM card, just like the Samsung Gear S. Unlike the Samsung, though, MICA doesn't actually allow you to make phone calls. Instead, it allows you to receive text messages from your "VIP list" (Read: Anyone who you decide to give your MICA's phone number to). But here's the catch: There's no on-board keyboard. Instead, any text-messages you want to reply to will have to settle for one of the 50 or so canned responses on your MICA. There's no voice control, so that's out, but you can make your own custom messages by plugging your bracelet into your computer and using the accompanying website. Still, anything more than "Gonna be 5 minutes late" or "Got it" is probably going to be getting a little too specific to actually ever be useful. In addition to some texting, the bracelet (which its makers are very careful not to call a smartwatch) will send you calendar and event notifications, let your accept or decline Facebook events, use TomTom-powered GPS to tell when you're going to be late, and Yelp to offer both local search and suggestions. There are no directions, though, so if you do happen to be running late, your actual phone is a far better bet. It's also worth noting that, at least in this iteration, there is no voice control. Of course, the benefit of such limited functionality is that does mean it might not suffer from one of other smartwatches' biggest drawbacks—battery life. The MICA will supposedly get up to 48 hours, but when we asked how long battery might last with heavy use, the best answer we got was "not 48 hours." Perhaps most notably (and again, unlike the Samsung Gear S), this isn't going to connect to your phone in any way—at least not yet. You will have to explicitly give anyone you want contacting you on your bracelet a separate number that will, of course, accept nothing but texts. You know, like a beeper. While the bracelet, which retails for $500, might seem steep, that does come included with a two-year data plan from AT&T. After those first two years it's up to you, but that's not a horrible deal as far as data is concerned. And for all its limited functionality, the target market for this bracelet probably doesn't even care. This thing is going to be sold exclusively at Barney's, and the people buying it are probably going to be more interested in form factor than actual function. And at least to my untrained eye, it does seem like they at least got that part down.